President Barack Obama has received plenty of media attention for his recent cabinet appointments. Lately, however, the attention has focused on the criticism that his appointments are not diverse. Senator John Kerry (D-MA) was appointed to replace Hillary Clinton as Secretary of State after UN Ambassador Susan Rice withdrew her name from consideration. President Obama appointed Chuck Hagel, a Republican from Nebraska, to be the next Secretary of Defense. On the same day he announced Hagel’s appointment, Obama also appointed national security specialist, John Brennan, to head up the Central Intelligence Agency (CIA). On Thursday, President Obama announced the appointment of Jack Lew to be the next Treasury Secretary, another important cabinet position. Outspoken critics of the president’s appointments have focused on the fact that all four appointees are white males. Political analysts have been quick to point out, specifically, the lack of women being appointed to top positions. 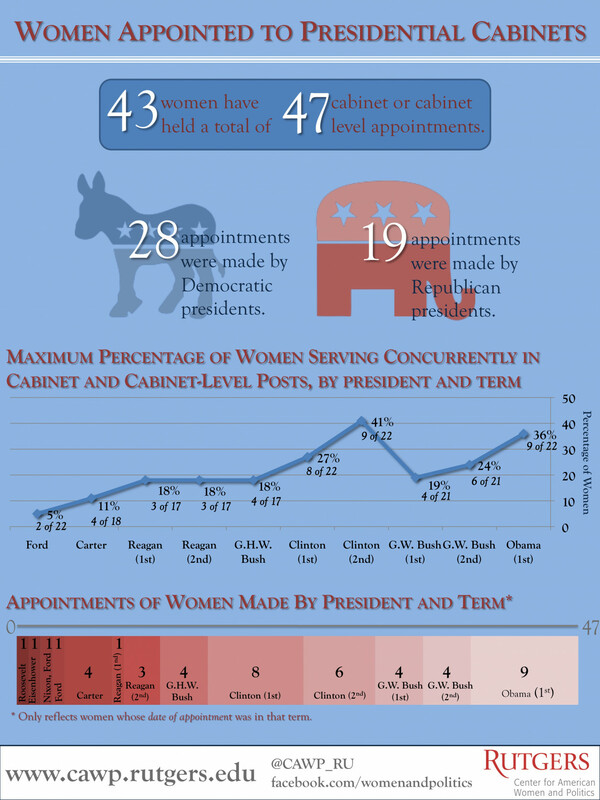 Here is a look at women appointed to presidential cabinet positions in modern U.S. history.